click here to watch the recordings of presenters, committee discussions, and resources discussed. Students striving to reach Outstanding Classification must score: SAT 1310, ACT Aspire, 28. SBEC Rules: The State Board for Educator Certification submitted rules allowing any certified teacher to teach Family Consumer Science. 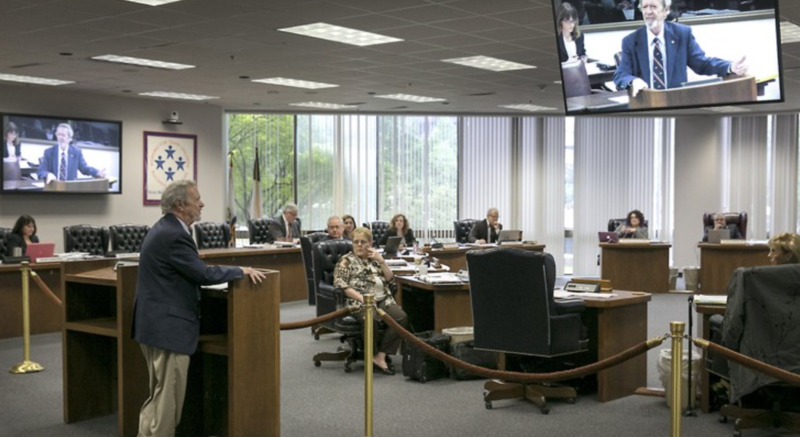 The State Board of Education voted in support - rules go into effect 2019. 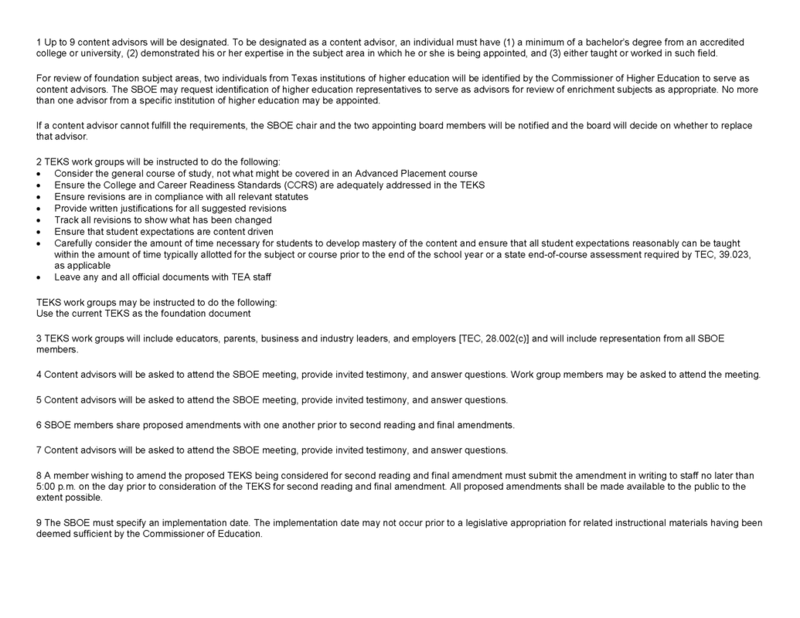 Additionally, SBEC submitted rules disallowing teachers with Master's degrees to become certified School Counselors via ESC alternative/accelerated programs. The State Board of Education voted this rule into effect, 2019. Watch the archived video here. We voted 14-1, disapproving the book for adoption. Click here to read my formal statement. Click on the image below to read the American Statesman article. Education Finance Committee: Representative Keven Ellis, District 9 (R-Lufkin) is the TXSBOE appointee. The first meeting is scheduled for 11 Jan, 8:30a. The committee meeting will be live-streamed and available on-demand. Updates: The Social Studies Streamlining efforts are scheduled to begin in January 2018. There is still time to apply and/or nominate yourself/colleagues to the workgroups. Surviving the Angel of Death: The True Story of a Mengele Twin in Auschwitz, publisher Tanglewood Publishing, Inc. I invite you to review these materials as an Individual, join our Work Groups, and submit a formal review. For more information, please contact me. If you prefer to submit your comments and/or review directly to the State, click here. Click to visit the Proclamation 2018 webpage, where you can review reports listing publisher responses to errors and editorial changes reported by the state review panels, errors and editorial changes reported by publishers, and publisher responses to comments made by the state review panels. What does Streamlining mean? 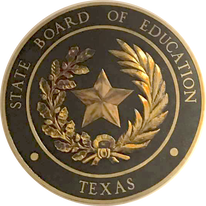 The State Board of Education, in collaboration with work groups comprised of experts, students, parents, educators, and stakeholders from across the state, will determine which TEKS are no longer to be tested. "If it's not tested, it's not taught." Let's remember that we are talking about teachers - certified, credentialed, professional individuals who enter the career of education to make a difference in our children's lives. Let's treat them like the professionals they are and put an end to this false and negative rhetoric. 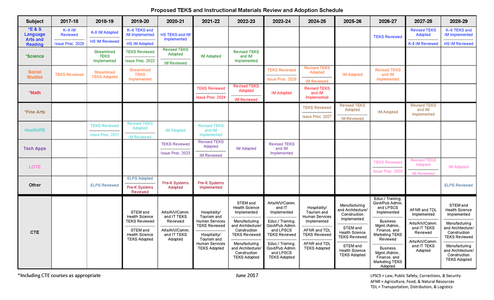 In February of 2015, the Texas State Library & Archives Commission began the process of updated and revising the School Library Program: Standards and Guidelines for Texas - originally adopted in 2005. The 2017 revision is aligned with current Texas Education Code and Texas Administrative Code. School libraries are essential, and most effective when staffed by full-time, certified school librarians. The Goal: Great Student Outcomes! The revised standards are based in research correlating library resources and student achievement. "Let's work together in an effort to provide all students with distinguished school libraries." 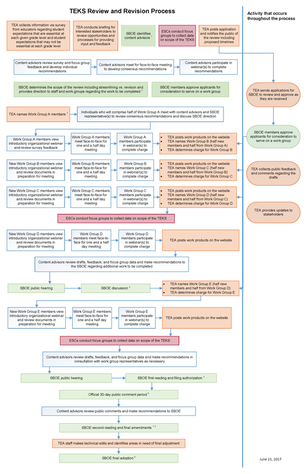 TEC, §38.003 as amended by House Bill (HB) 1886, 85th Texas Legislature, Regular Session, 2017, requires that a State Board of Education (SBOE) program that outlines screening or testing of students for dyslexia include screening at the end of the school year of each student in kindergarten and each student in the first grade. 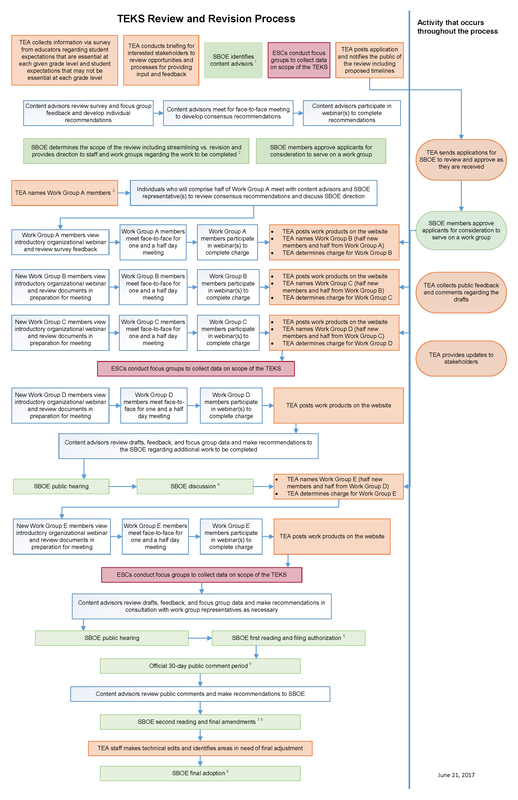 which contains guidelines for school districts to follow as they identify and provide services for students with dyslexia. Information regarding the state's dyslexia statutes and their relation to various federal laws is included. The Texas Education Agency has added a Spanish Language Support Team. I would like to acknowledge the hard work and efforts of the Agency for putting together a Spanish Language Support team. In Spanish, there is a saying that goes, "Un hombre bilingüe vale por dos!" In English: Someone who is bilingual is worth twice as much. Our students are growing up in a world that gets smaller by the day thanks to break throughs in technology. In this ever shrinking world, it is vital for our country to maintain a competitive edge and our students to be fully prepared to participate in the global economy. Language proficiency in more than one language is a huge step in giving our students the tools for success in the future. I appreciate the forward-thinking of the Texas State Board of Education and the Texas Education Agency. ​The irony that this announcement was made on the first day of Latino Heritage month was not lost on me. Gracias por su dedicación y trabajo duro. De tener éxito mañana, significa prepararse hoy. Estoy muy entusiasmada con lo que el futuro tiene para nuestros estudiantes." High School English & Spanish Language Arts and ESOL Standards Approved! Again, we received unanimous support for the ESOL and ENG I-IV Standards we proposed! Special thanks to our writing team: Ms. Marianne Sotelo, Ms. Lucia Palomino, Ms. Nicole Hohensee, and Ms. Shannon McCombs, who represented classroom practitioners from across the State and all 20 ESCs. 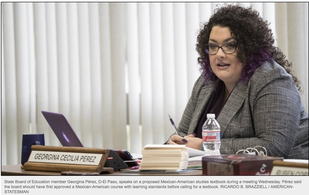 Revised high school English language arts and reading curriculum standards and English for Speakers of Other Languages (ESOL) curriculum standards won final approval from State Board of Education members June 23 on a 13-0 vote. 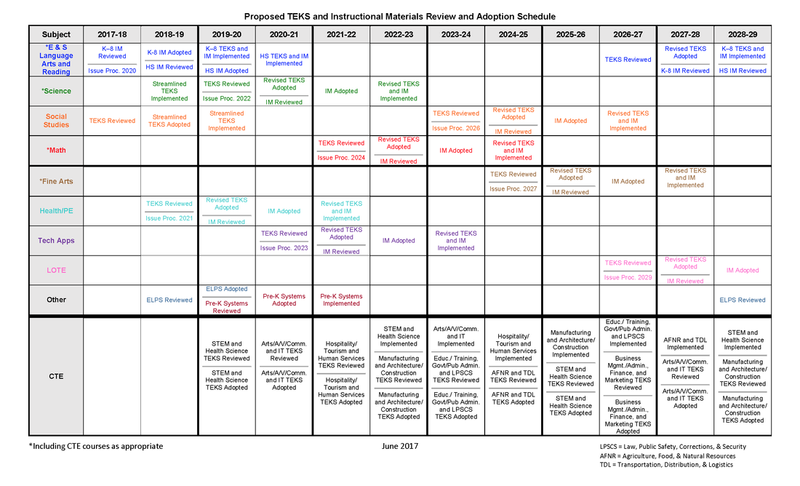 The new high school TEKS will be implemented in the 2020-2021 school year. 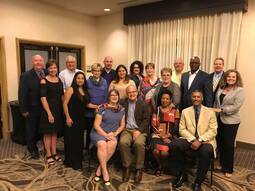 ​I would like to take this opportunity to express my gratitude to my colleagues for the confidence they have in me as a newly elected board member to serve on the Long-Range Plan Committee. 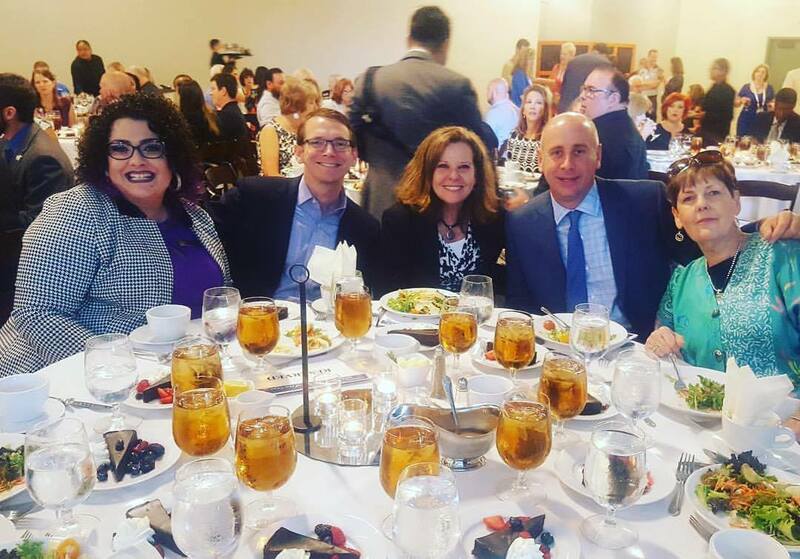 Throughout my career in curriculum development, I have seen first hand the echoes of decisions we make implemented in the classrooms of schools across Texas.Indeed, it has been my career’s focus before and after my election to the State Board of Education. Although at times we may differ on policy, we will never disagree about the importance of Texas students learning in the classroom. ​The State Board of Education has begun establishing the membership of the 18-member Long-Range Plan Steering Committee. The public nomination period is now open. This committee will help the board establish goals for public education for the next five to seven years. Community meetings and a statewide survey will also help inform the crafting of these goals. The revised science Texas Essential Knowledge and Skills for kindergarten through twelfth grade, which were approved by the board in April, are now posted. 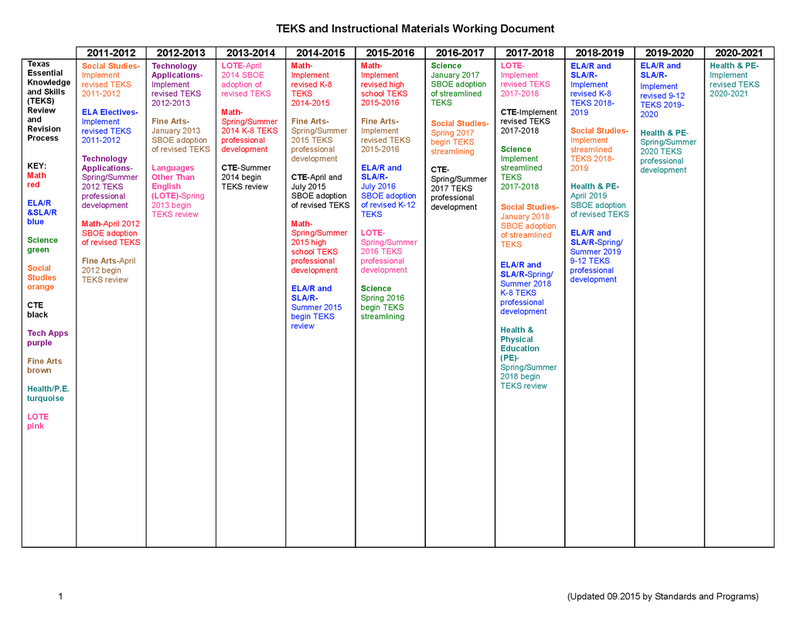 Unlike the recently approved language arts and reading standards which underwent major restructuring and revisions, the science TEKS were streamlined or reduced. The streamlining was done in response to concerns that it was difficult to teach all the grade-level standards during a standard school year. A summary of action taken at the June 23 State Board of Education general meeting is posted at here. 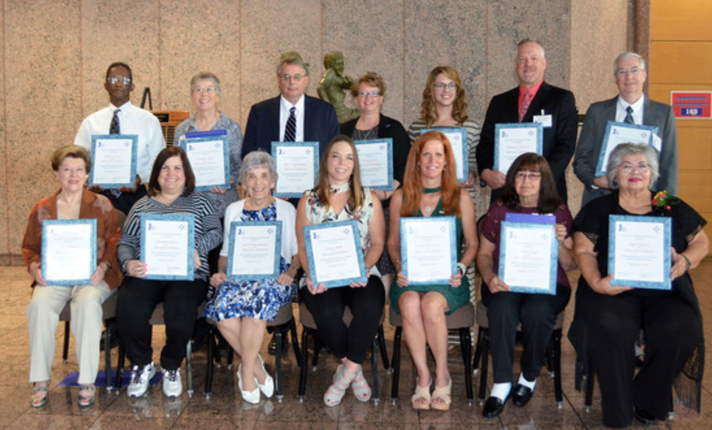 The State Board of Education recently honored 15 public school students as 2017 Student Heroes for exhibiting caring and compassionate assistance to people in their schools and communities. Some of their activities included tutoring, preparing bags of essential items for foster care children, creating a drum line, assisting students with disabilities and hosting birthday parties for homeless children. Which agenda items were accomplished? Reviewed by academic experts in the subject and grade level for which the instructional material was submitted. (Senate Amendment made by Silvia Garcia (Houston-D). ​ Review TASAs "Bills sent to the Governor's desk"
HB 21 – A school finance bill with an education savings account program added died when the House and Senate could not reach a compromise. HB 515 – This was a student assessment bill that originally would have eliminated the current promotion requirements tied to standardized tests and eliminated social studies STAAR exams. SB 1883 – This bill would have created an appeal route for charter applicants that were not initially granted an interview and would have eliminated the SBOE’s veto authority. SB 1776 – This bill would have eliminated the STAAR U.S. History end-of-course exam and substituted it with a test given to immigrants seeking U.S. citizenship. Our office has the very distinguished honor of announcing that every one of the Spanish Language Arts and Reading recommendations - totaling over 20 pages of amendments - was voted upon unanimously, creating the best and most rigorous SLAR standards the students of Texas have ever had. The reason this is significant is because the work originates in Region XIX, the area which demonstrates the most success with English Language Learners - framing this course of study for every Language Learner and Dual Language Learner in the state. Each year, we have the honor of naming the Texas State Board of Education, District 1 Student Hero. 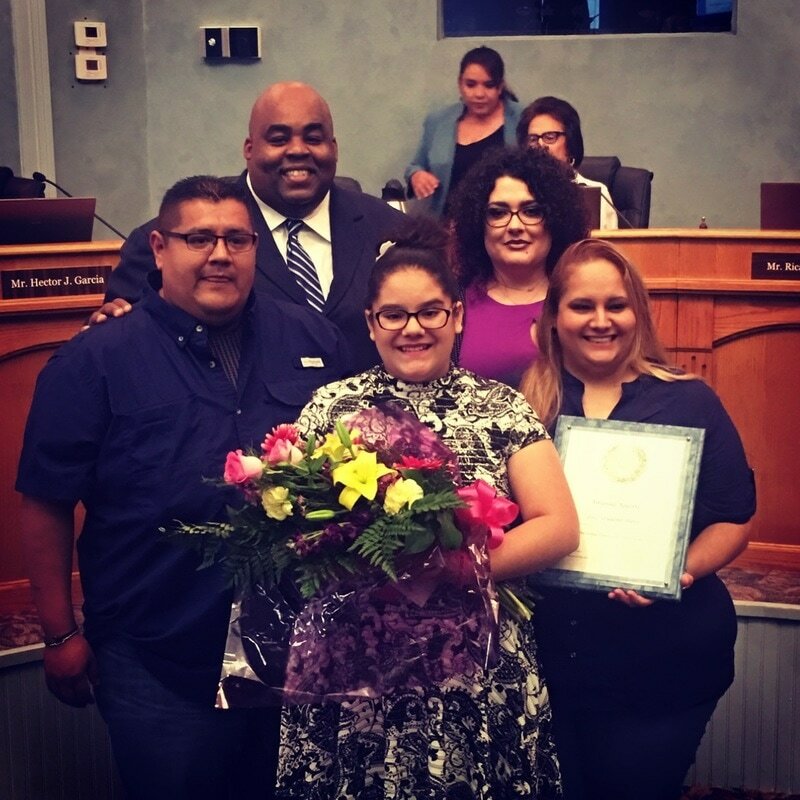 This year, the award goes to Ms. Amanda Aguirre, a 5th grade student in Laredo ISD. Among the many reasons that Amanda is deserving of this award and much more: she has donated her hair to Locks of Love twice and is working on her third donation now. Additionally, she makes care packages for children whose parents are deployed, goodie bags for families in need, collects bottle tops for free cancer treatments for children, and donates books to her community church. It is not everyday that we are blessed to have angels walking amongst us ~ we are truly the fortunate to have Amanda with us. The world could use more Amandas. 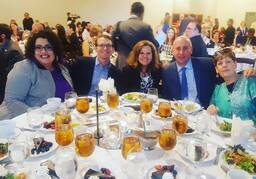 During the Public Hearing on Science Standards (TEKS), these four educators testified on the importance of authentic and effective Science education, focusing on the best interest of Texas students. "State panel limits teaching phenomena that challenge evolution"
Yes, lots and lots of time and effort goes into creating great documents for our students. Check out the first ever, live-stream, statewide teacher workgroup revising standards in a collaborative and transparent effort. Educators from Region 19 (El Paso), Region 13 (Austin), Alief ISD (Houston), Canutillo ISD, El Paso ISD, San Elizario ISD, La Fe Prep, and Ft Hancock ISD (Hudspeth) - all working on Spanish and English Language Arts and Reading so our Spanish speaking students learn English well... and our English speaking students learn Spanish well, side by side in Dual-Language classrooms across Texas. ​This week, the CISD Board of Trustees proposed a misguided resolution containing discriminatory terminology, aimed at low-income students. Here is some of the media coverage: El Paso Times, KTSM, KFOX, KVIA, El Diario, and our released statement read at the CISD School Board meeting. "Considero que si el Estado necesitaba saber nuestra opinión, debe de estipular una resolución más concreta y por supuesto revisar la terminología y el lenguaje usado, porque esta resolución en particular es bastante confusa, el lenguaje es discriminatorio, vergonzoso, hiriente y un insulto a la comunidad y a la historia de la comunidad. Como institución educativa pública que somos, tenemos la responsabilidad de brindar educación a cada niño del distrito sin importar su estatus económico, su etnicidad, su raza o su lenguaje. Debemos ser bandera de inclusión, no seleccionamos, no escogemos, sólo debemos de comprometernos con su educación. Básicamente el mensaje que están mandando es que ‘tú no eres bienvenido a nuestro distrito si eres pobre." "Let us not forget that this body exists for the purpose of public education - not a private school, not a parochial institution or corporate charter school that selectively chooses the children the entity wishes to serve. You are here for all students, not just those with more money, those with more resources, or those with, as one board member put it in the paper, fewer “social and related problems" without the funding necessary to address those problems. This resolution is non-binding, but it sends the wrong message to students and the community and is inconsistent with American values of equal opportunity. ​I’m not exactly sure who thought putting this item up for a vote was a good idea, but shame on them." 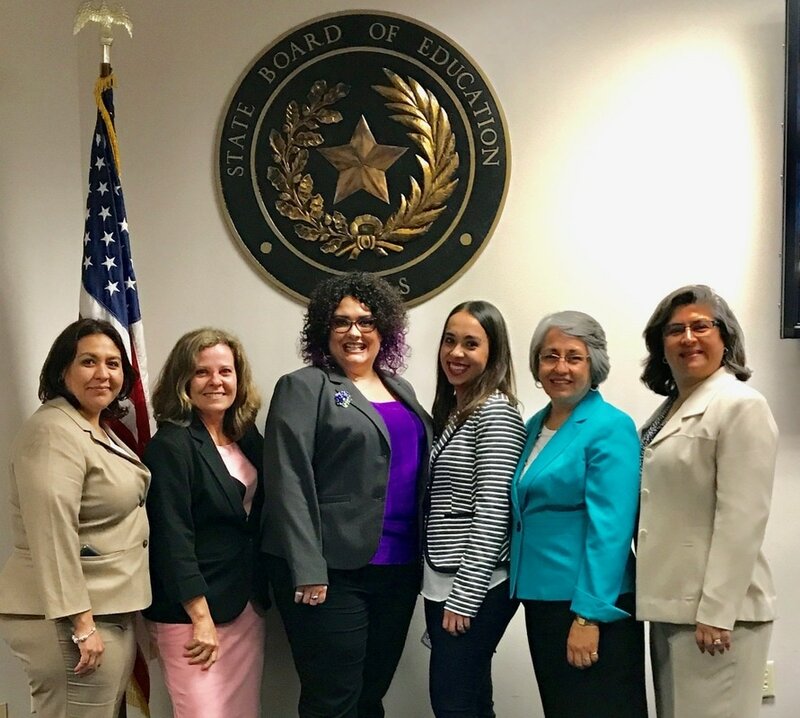 I want to take this opportunity to bring you all up to speed on what we were able to accomplish at the first meeting of the Texas State Board of Education for this term. 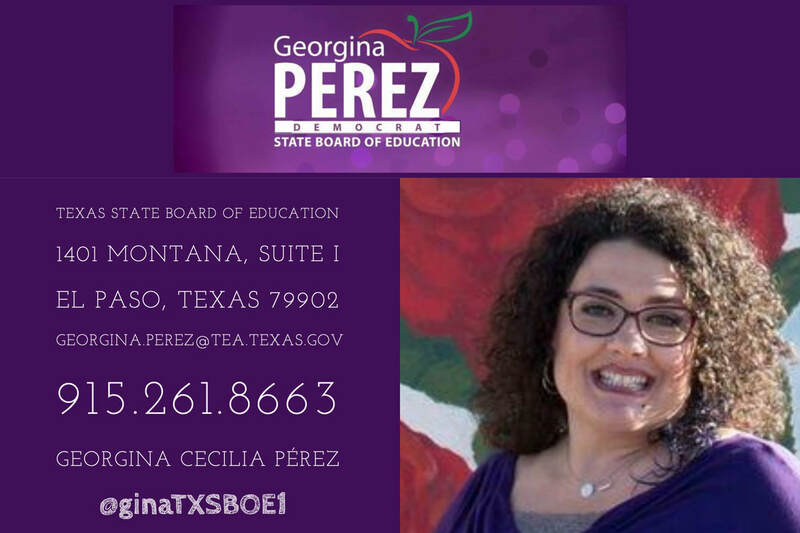 I have been committed to ensuring that the TXSBOE is more inclusive for all Texans. I proposed a rule change that would prevent the Chair from limiting public comment to just 30 minutes. Previously if you drove all the way to Austin from El Paso, Odessa, the Trans-Pecos area, or Laredo to address the Board, there was a good chance you wouldn’t even be heard. Now everyone will get their opportunity to address the Board. 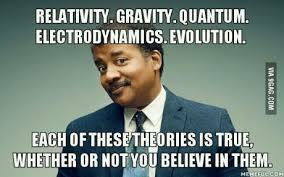 We demonstrated that the 4 TEKS in question, focusing on theories outside of the realm of science - leading students to question evolution and introduce creationism - were never written by teachers or scientists, rather they were written by TXSBOE members in 2009. In this article written by former TXSBOE Chair Don McLeroy (appointed by Gov. Rick Perry), who put passages in standards, said he wanted to lead students to creationism. We worked closely with professionals from Region XIX before the meeting and took suggested amendments for K-8 to Austin for consideration. We were able to pass all amendments K-8, submitted by the Region XIX teacher group without opposition. Because Region XIX leads the state in SLAR and ESL success, our suggested amendments were accepted and we will be sharing our strategies with the rest of the state with the hopes of duplicating our success in this area across Texas. 2nd, and Final, Reading of Science, ELAR K-8, SLAR K-8, and ESL TEKS will occur in April 2017. 1st Reading of ELAR 9-12 and SLAR 9-12 TEKS, will occur in April 2017. 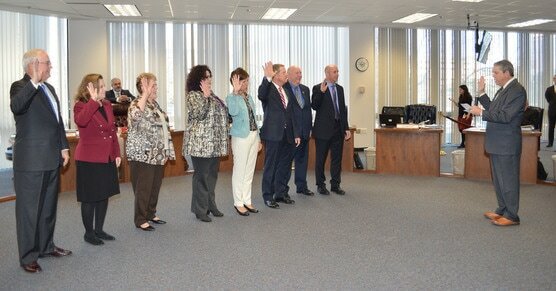 Read the summary of votes taken at the Jan. 31 and Feb. 3 General Meetings of the Board.